The Evolved Sea Sparrow Missile is developed by Raytheon Missile Systems. The ESSM anti-ship missile has a length of 3.64m. The ESSM missile is powered by Mk 134 Mod 0 rocket motor. The Evolved Sea Sparrow Missile has a range of more than 50km. The missile is equipped with a 40.5kg annular blast fragmentation warhead. The Evolved Sea Sparrow Missile (ESSM) (RIM-162) is a medium-range, surface-to-air missile designed and manufactured by Raytheon Missile Systems. The missile is currently in service with the US Navy and some of the 12 NATO Sea Sparrow consortium nations. ESSM (RIM 162) offers naval combatants reliable self-defence and high fire-power. 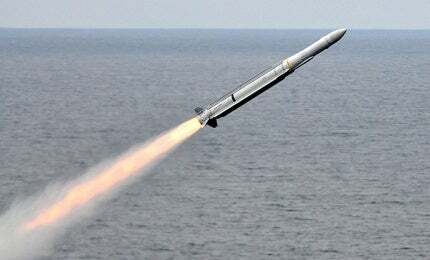 The missile can be launched from surface ships to destroy threats that include high speed, highly manoeuvring anti-ship cruise missiles, low velocity air threats (LVATs), high-diving threats and surface-based targets. It can also engage attack aircraft, helicopters and ships. The missile successfully engaged aerial threats during the combat system ship qualification trial of the Nimitz-class aircraft carrier USS Theodore Roosevelt in May this year. SeaRAM is an anti-ship missile defence system designed and manufactured by Raytheon. The ESSM surface-to-air missile is an upgrade to the RIM-7 Sea Sparrow Missile. The ESSM programme is an international cooperative effort supported by the NATO Sea Sparrow consortium nations including the US, Australia, Canada, Denmark, Germany, Greece, Norway, Spain, Turkey and the Netherlands. The member nations are governed by a production memorandum of understanding (MoU) and multi-national work-share arrangement. The NATO Sea Sparrow programme began in 1990. The propulsion system was jointly developed by Alliant Techsystems (ATK) and NAMMO / Raufoss of Norway, under an agreement with Raytheon. The development began at ATK’s allegany ballistics laboratory in 1995. Raytheon delivered the first production ESSM to the US Navy in 2002 and the missile entered into service in 2004. Raytheon received a contract from Abu Dhabi Ship Building (ADSB) in October 2004 to deliver MK56 ESSM vertical launching systems (VLS) for four Baynunah class corvettes of the UAE Navy. The Government of Thailand signed an $18m foreign military sale agreement with the Defense Security Cooperation Agency for a possible sale of nine ESSMs and associated equipment. The 2,000th ESSM was delivered to the NATO Sea Sparrow consortium in August 2012. The missile successfully engaged a high-diving, supersonic threat when fired from the US Navy’s self-defence test ship in May 2013. The Royal Australian Navy’s ESSM is being upgraded to block two standard to deliver increased firepower against anti-ship missiles. The block two missile received first pass approval in June this year. The ESSM anti-ship missile is equipped with a tail-control system to obtain high speed and manoeuvrability. The missile, which can operate in all weather conditions, has a length of about 3.64m, diameter of 254mm and a weight of 280kg. "The Sea Sparrow SAM is equipped with an improved semi-active radar homing guidance system." The missile can be loaded in a quad-pack canister for the MK 41 VLS shipborne launching system or in a single pack for the MK 29 trainable launcher and MK 48 guided missile VLS. The ESSM is also capable of being fired from the MK 57 VLS and the MK 56 dual pack ESSM launching system. The Sea Sparrow missile can be integrated with the Aegis weapon system, MK 57 NATO Sea Sparrow missile system (NSSMS), Flexfire weapon control system, ship self-defence system (SSDS), Total Ship Computing Environment, and APAR combat systems. The Sea Sparrow SAM is equipped with an improved semi-active radar homing guidance system in an 8in diameter forebody guidance section. The guidance system uses inertial / command mid-course continuous wave radar or interrupted continuous wave radar illumination-data. Both X-band and S-band data links are used to transmit the information to the combat systems. The Sea Sparraw SAM provides increased performance against smaller targets. The missile is equipped with an insensitive munitions (IM)-compliant, annular blast fragmentation warhead, weighing 40.5kg, and offers high lethality against anti-ship missiles. "The propulsion system provides the missile with a speed of over Mach 4 and a range of more than 50km." The ESSM anti-ship missile is powered by a high performance Mk 134 Mod 0 rocket motor dual-propellant propulsion system that develops high thrust. The motor can operate in temperatures ranging between -14°F to 133°F. The propulsion system provides the missile with a speed of over Mach 4 and a range of more than 50km. The rocket motor measures about 78.8in long, has a 10in diameter and weighs 167.8kg. It features D6AC steel design and incorporates an aramid-filled ethylene propylene diene monomer insulator, a blast tube nozzle, dual concentric hydroxyl-terminated polyether (HTPE) propellant, igniter, a solid-state laser initiation system and a thrust vector control system.